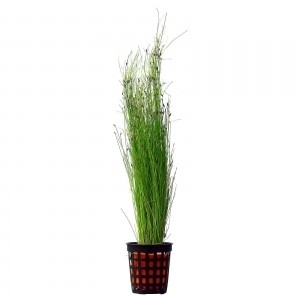 Eleocharis vivipara is the taller variant of the well recognized Dwarf Hairgrass. This plant is really like an aquatic grass, with thin stalks growing from roots that spread horizontally by sending our runners. Due to its tall height, this plant makes a stunning background plant when grown in large clusters. 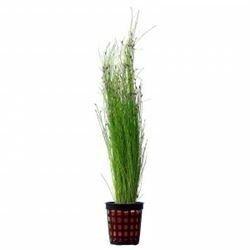 High lighting and Co2 injection is not always necessary to grow hair grass but it will definitely increase the growth speed and thickness of the foreground. Simply separate larger mats into small portions and plant each an inch or so apart half way into the substrate. After several weeks, the plant will send our runners all around and a lush foreground of grass can be created.